This time, the dissonance between Trump's words and the political reality was more jarring than ever. 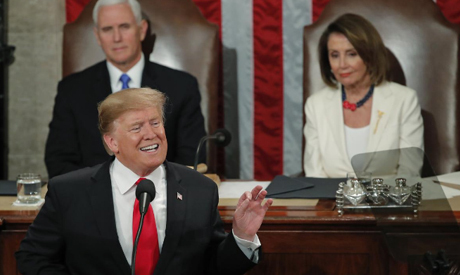 For the first time in his presidency, Trump had a Democrat seated behind him in the House chamber, Speaker Nancy Pelosi, and spoke to a Congress where Democrats share power with Republicans. "While there were many unifying moments, the president took time to appeal to his base over issues that split the parties such as investigations, immigration and abortion," said Ron Bonjean, a longtime Republican strategist in Washington. "Nothing has changed after tonight's delivery by Trump because both sides are simply too dug in to allow any sort of major compromise legislation to occur," Bonjean said. In doing so, Trump employed much of same rhetoric he used during last year's congressional elections, warning of an "onslaught" of migrants from Central America, labeling the border "lawless" and declaring that "countless" Americans had been murdered by illegal immigrants. For a reminder of how his party fared in those midterm elections, Trump only had to look at the sea of white outfits worn by Democratic women in attendance on the House floor. They chanted "USA! USA!" when Trump recognized their achievement. Trump also re-stoked America's culture wars, spending a portion of the speech blasting abortion-rights legislation in New York and Virginia, a move that will endear him to evangelical voters. "There was very little difference between this speech and what you'd hear at one of his campaign rallies," said Doug Thornell, a longtime Democratic congressional aide. "To many people this speech will be remembered for his continued obsession with the wall, the demonization of immigrants, and his bizarre attack on congressional investigations. Truly stunning." "After a tough couple of weeks, this was the reset that Trump needed," Conant said. "He laid out a popular agenda and framed the big political issues of the day in the most favorable way possible." There are clear signs that the showdown over the border wall has dinged the president: The most recent Reuters/Ipsos tracking poll had Trump's approval rating at a shade over 39 perrcent, the lowest it has been since early last October. With Trump's re-election campaign set to begin in earnest, the president must also await the final determination of Special Counsel Robert Mueller, who is investigating ties between Trump's campaign team and Russian officials as well as possible obstruction of justice. "There is no reason to think he wants unity. He thrives on disunity," said John Geer, an expert on public opinion at Vanderbilt University. "The president may call for working together, but past behavior suggests otherwise."